SEATTLE, Washington, April 19, 2010 (ENS) – Westward Seafoods Inc., a Seattle-based company that operates a seafood processing plant in Dutch Harbor, Alaska, will pay a $570,000 civil penalty to resolve alleged violations of the Clean Air Act and the Emergency Planning and Community Right-to-Know Act. The settlement agreement announced today by the Justice Department and U.S. Environmental Protection Agency resolves a federal complaint alleging that Westward Seafoods violated the Clean Air Act many times from 2002 until 2006. The federal government alleges that Westward burned 1.3 million gallons of diesel fuel with excessive sulfur; operated three diesel generators while air pollution control devices were inoperable, resulting in excessive emissions of nitrogen oxides; and failed to respond to repeated requests for information from state and federal inspectors. Under the settlement agreement filed in federal court in Alaska, Westward Seafoods must create a preventative maintenance and operations plan and also must develop and implement an annual training plan for all employees responsible for operating generating equipment. The company must develop and submit to EPA an organizational chart that outlines staff that have environmental compliance responsibilities and develop internal procedures for submitting required reports to federal, state and local environmental agencies. “We have laws regulating emissions and chemicals for a reason – these substances can have serious consequences for residents and the environment,” said Edward Kowalski, director of the Office of Compliance and Enforcement in EPA’s Seattle office. High sulfur fuel produces higher levels of sulfur dioxide emissions, which has harms human respiratory systems, especially in at-risk populations including children, the elderly and asthmatics. Operating the generators without required air control devices caused an increase in nitrogen oxide air pollution, which has adverse respiratory effects on humans and is a leading contributor to ground-level ozone. “We work closely with the state, and we will act when a facility is not responsive to state requests, or is putting the environment and Alaskans at risk due to unlawful practices,” Kowalski said. The complaint also alleged violations of the Emergency Planning and Community Right-to-Know Act, a law designed to help local communities protect public health, safety and the environment from chemical hazards. The complaint alleged that Westward failed to annually report 80,000 pounds of ammonia in use and storage at the Dutch Harbor plant to the State Emergency Response Commission, the local fire department and Local Emergency Planning Committee. “We expect companies that handle hazardous chemicals and operate diesel generators to comply with the law. This settlement is designed to put a system into place that will prevent future violations of the environment and public safety laws,” said Ignacia Moreno, assistant attorney general for the Justice Department’s Environment and Natural Resources Division. Westward Seafoods is a wholly owned subsidiary of the Japanese company Maruha Nichiro. 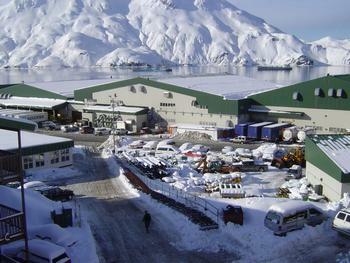 At its Dutch Harbor processing plant Westward has a total production volume of 254 million pounds of seafood, including pollock, cod, halibut, black cod, king crab, snow crab and Dungeness crab. The consent decree, lodged in the U.S. District Court for the District of Alaska, is subject to a 30-day public comment period and approval by the federal court. Click here for a copy of the consent decree.